"2nd Annual Community Fair with over 2,000 customers. Music, children's activities (petting zoo), food, and much more. In partnership with Relevant Life Church and CCA. We will have 50 spaces available for craft vendors." "Spring is here and all that comes with it! Let's have a blast while Mirandas Cantina shows their support for Community & Small Business! Enjoy Amazing food, Cold drinks, Listen to some great tunes from Local artists, and support small business by shopping local vendors! That's NOT ALL! Bring your kiddos and take part in a HUGE Easter Egg Hunt! There won't just be goodies for the kiddos in those eggs either, some for the parents too! This event will be indoor, outdoor... We are believing for PHENOMENAL weather! Want Easter pics taken? We gotcha covered there too! There will be a Photog with an Unique set up to take help add to that memory album! (Packages available - costs vary) Have you had a meal at Miranda's yet? If so, then you know to come hungry ... if not... take my word for it... you WILL wanna wait to eat when you arrive! We will have a Bounce House for the kids, face-painter, balloon twister, a CHOO CHOO train... Prizes, and TONS of FUN! 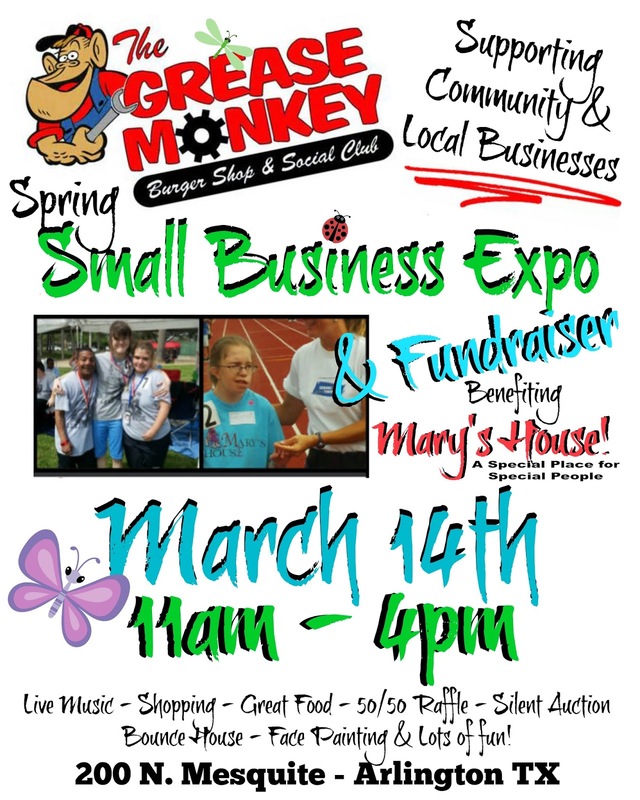 Come show you support for local businesses! Make it a family day! SEE YA SOON!" "Meet local artisans and shop for handmade works of arts!" "Multifamily Rummage Sale, Hundreds of items $5.00 or less, Baby and Toddler clothes starting at .50, Handbags starting at $3.00, And hundreds of other items. Come shop with us!!" For more information, contact their event coordinator at Judi.Walls@Fairviewbaptistgp.com / Church Office 972-264-6277. Booths are 10 X 10 and cost $100. Vendor must bring everything they'll need (table, chairs, canopy, etc.). No electric. To apply, email info@ggaproductions.org by April 15th w/photos of your products (unless you have worked together before), Texas State Tax # if applicable, contact name/phone/mailing address, then an invoice will be emailed to you. If another rep pays before you, your invoice will be cancelled. If your invoice is not paid within 7 days, it will be cancelled. Booths are an 8FT table and 2 chairs for $75. This fee includes free parking, limited electric and free wi-fi. There are several junior hockey and ice skating events going on during this Saturday. Parents/spectators watch from the second level, know as ""The View."" This is a climate controlled area and there will be no charge for people to shop with vendors.""" To apply, please email info@ggaproductions.org by April 05, 2015 w/photos of your products (unless you have worked together before), Texas State Tax # if applicable, contact name/phone/mailing address, then an invoice will be emailed to you. If another rep pays before you, your invoice will be cancelled. If your invoice is not paid within 7 days, it will be cancelled. This show has been marked as CANCELED due to multiple failed attempts to reach the event coordinator. "Lone Star Park craft fair with 120-150 vendors with jewelry, kitchen items, hand crafted wood work, hand crafted metal works, children's book, boutiques, children's clothing, candles, aromatherapy, chiropractor, massage, and much, much more! There will be a live radio broadcast, food trucks, and the host of our charity event/raffle will be Mrs. Texas, Crystal White. We will have sponsor events, drawings for pro sporting event tickets (football, basketball, baseball and hockey), along with other activities for the family. Admission is FREE, while the raffle events and donations will go 100% to local charities and families in need." Applications are available here and are due by July 11th, 2015. For more information, visit their website or contact their event coordinator at info@alonewithus.com. Booths are 10 X 10 and cost $60. No electricity. No raffle item required at this event. Applications are available here and are due by March 25th, 2015. "Conference to awaken and restore passion in every area of life. Vendors will be able to showcase their product or services." Booths are 6 X 6 and cost $100.00. This fee includes media coverage, 6 x 6 table, 2 chairs, electricity, light snacks and showcased in our event program. Applications are available here and are due by April 22, 2015. For more information, contact their event coordinator at trinalokko@gmail.com / 214-253-1696 at Katrina Lokko. "Community Opportunities Inc and the Bud E. Bee Crafters present our first craft and direct sales shopping EXPO. We are looking for hand made items, cottage kitchen baked or direct sales vendors to join us for this shopping event. We will be holding our event in the wonderful Cleburne Conference Center---this is an indoor show! We currently have space for up to 37 with an option to grow if registrations meet goal deadline of March 31st. (Update: There will be space for 60 vendors.)" Booths for this event are full (Updated: 6/9/2015). Booths are 8 X 10 and cost $35. This fee includes 1 table 2 chairs included. Applications are available here and are due by June 30th, 2015. For more information, visit their website or contact their event coordinator at pammasters@clc-coi.org pamm@coigroup.org / Brenda 817-558-0048 or Pam 817-487-3279. Booths are 10 X 10 and cost $35 (outdoor). Applications are available here and are due by within 48 hours of claiming booth. Applications are available here and are due by May 2nd, 2015. For more information, visit their website or contact their event coordinator at CCWCraftFair@hotmail.com / Lisa - 817-430-8749. Applications are available here and are due by April 6th, 2015. For more information, visit their website or contact their event coordinator at mollyfawkes@yahoo.com. Booths are six foot tables and 2 chairs. No electricity. Limited booth space. This is indoors only and each vendor will be provided a 6-foot table and 2 chairs. All vendors will be in the Dupree Theater lobby. Vendor space is free, and is available on a first come-first serve basis. Applications are available here and are due by March 27, 2015. For more information, visit their website or contact their event coordinator at fwitte@cityofirving.org / 972-721-2355. Applications are available here and are due by March 21, 2015. 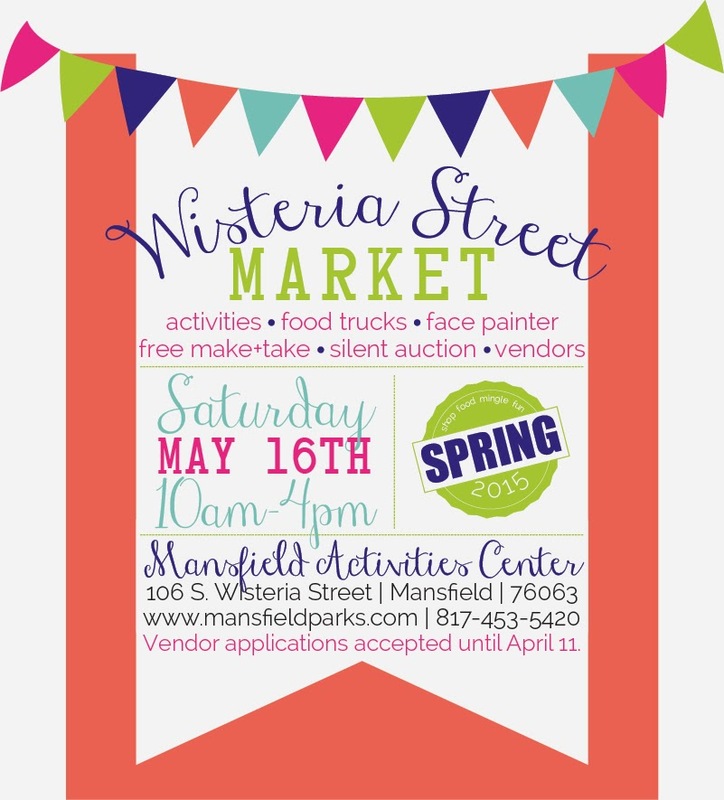 For more information, visit their website or contact their event coordinator at streetfair@wtwcommunity.org / 214.412.8440. "Western Hills High School Cheerleaders and Mascots are hosting the Cougar Cheer That’s Sew Crafty Craft Show – Vendor Event on Saturday, April 25, 2015 from 9:00am to 4:00 pm. Admission and Parking are free. This is an all-day event that features a variety of Handmade Items and your favorite Direct Sales Vendors along with several Food Vendors. We have a bounce house for kiddos to enjoy, face painting to brighten any kiddo’s day up, many more activities for the kids and a raffle that will be held throughout the day. All proceeds benefit the Cheerleaders and Mascots of Western Hills High School (located off Camp Bowie West at 3600 Boston Avenue, Benbrook, TX 76116). So make sure to mark your calendars and bring the whole family to enjoy a day of shopping, yummy food and lots of fun for everyone!" Located off Camp Bowie West and Boston Avenue. Booths are 9X9 for $35.00 plus raffle item. Electricity is additional $10.00. Applications are available here and are due by March 26th, 2015 April 20th, 2015. Applications are available here and are due by March 14th, 2015. "Martin United Methodist Church in Bedford, Texas is hosting a Craft Fair, April 18, 2015 from 9:00 - 4:00. We would love to invite you to join us for a day of fun, fellowship, and shopping!" (No electricity or tents provided outside. No Rain contingency plan available, no refunds). Electricity is $10, Tables are $12. Free drink voucher for vendors. For more information, view their Rules or contact their event coordinator at journeymumc4@gmail.com / 817-685-0713. This fee includes tickets to the rodeo on Friday and Saturday night. Applications are available here and are due by March 15th, 2015. For more information, visit their website or contact their event coordinator at vol-habitat@habitatwf.com / 940.716.9300.